At this point, Chevrolet’s “Real People, Not Actors” car commercials are bordering on cruelty. 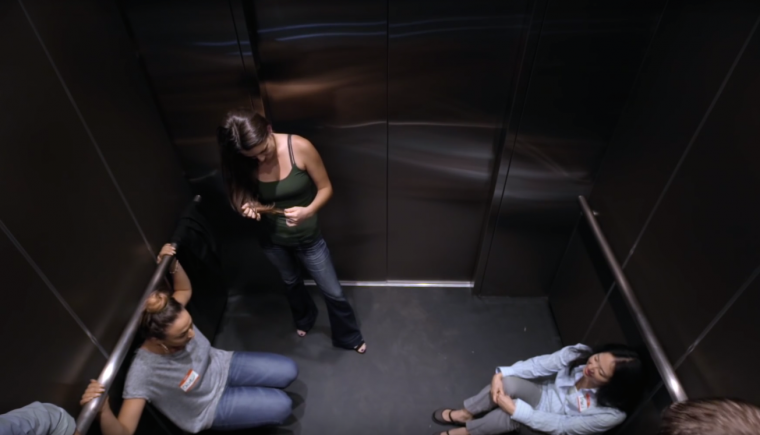 Thus far, they’ve subjected real people (not actors, who are clearly fake people) to invasions of privacy, terrifying pitch-black darkness, and most recently, being trapped in a small, enclosed space. Let’s hope these real people don’t suffer from real phobias like haphephobia, achluophobia, and claustrophobia. So, what was the point of this little exercise? To illustrate how driving a Nissan LEAF is just like being trapped inside of a broken elevator with a bunch of strangers. That may seem like a bit of a stretch, but there is some reasoning behind the strained metaphor. The LEAF can travel 84 miles on a single charge, while the new Volt has a 367-mile extended range. This is the second car commercial from Chevy that promotes the 2016 Volt by trolling its rivals. The first, “Time Capsule,” mocked the Toyota Prius’ battery technology as being out of date. We get the point of the ad, and the reason for Chevy’s cruel and unusual pranks played on these poor focus group members. But still, to paraphrase Taylor Swift—Chevy, why ya gotta be so mean?